Who would have thought? Haven't seen these babies since I was a little girl skipping to primary school. When I first noticed the trend, I was really not into it. But as always, trends just grow on you and I was sucked into it. I found the cutest grey one with tiny little stars from Aceessorize. Thank god hats are back on trend, I love wearing them in the winter but I hate looking like a little kid. It's gonna be so easy this winter! I have been watching Gossip Girl again when I get free time, so don't blame me for turning into Blair Waldorf from time to time. I couldn't help it. The pink velvet just got to me. It's the dream watch in my eyes. 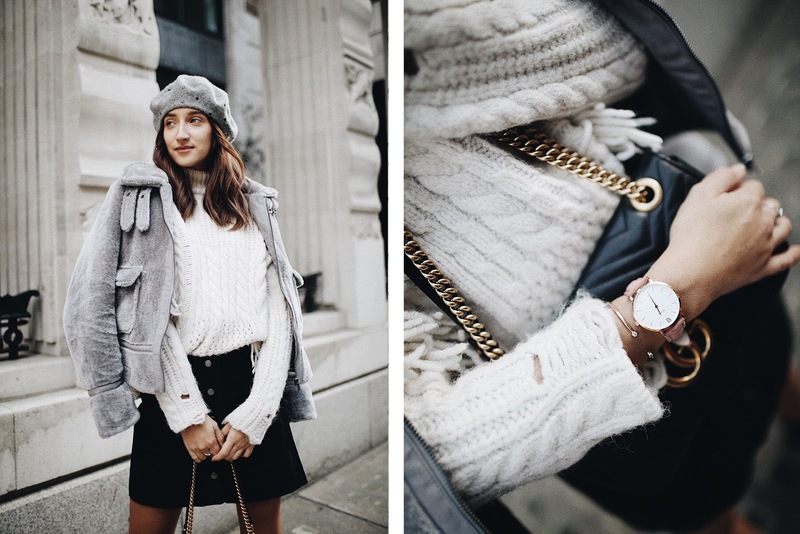 My favourite watch I own is a silver and rose gold Cluse baby, so to see my favourite brand collaborating with a famous blogger and brining out a velvet strap... YES PLEASE! Talking about velvet, if you're wondering how my bag turned from velvet to leather overnight... it didn't. This is my friend Justina's bag who took these beautiful photos. I made her create a blog so make sure you check it out! Love it, well done for new blog post! ❤️ Need that jacket!